Sheriff: Assailant In Maryland School Shooting Died From Self-Inflicted Wound : The Two-Way Initial reports following the incident at Great Mills High School suggested that a school resource officer might have killed the shooter. 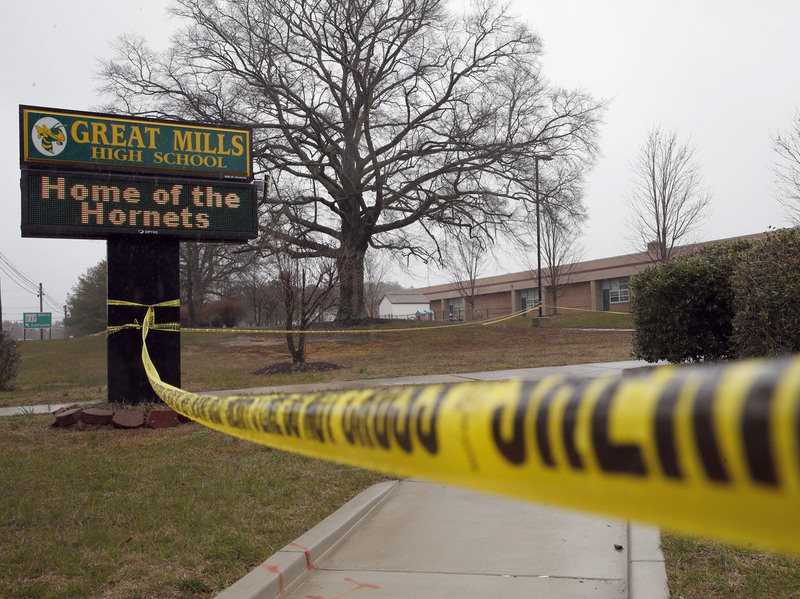 A photo from Tuesday, March 20, shows crime scene tape around Great Mills High School, the scene of a shooting in Great Mills, Md. Authorities now say that a student in Maryland who fatally shot a fellow classmate and seriously hurt another died from a self-inflicted gunshot wound during a confrontation with a school resource officer. Initial reports suggested that Deputy First Class Blaine Gaskill, the resource officer at Great Mills High School, in Great Mills, Md., might have killed the shooter, 17-year-old Austin Rollins. In a statement issued by the St. Mary's County sheriff's office said evidence indicates that last Tuesday, after Rollins fired a single shot that hit one student in the head and another in the leg, he was confronted in a hallway by Gaskill. Rollins, however, then "fired one fatal shot to his head; simultaneously DFC Gaskill also fired one non-fatal shot, which struck the weapon in Rollins' hand," it said. One of the two students hit by Rollins, 16-year-old Jaelynn Willey, died two days later after being taken off life support. The 14-year-old with the leg wound survived. "All indications suggest the shooting was not a random act of violence," the sheriff's office said in the statement. "Rollins and the female victim had a prior relationship which recently ended. The investigation has not yet uncovered any public social media posts/threats made by Rollins." "According to the sheriff's office, Rollins entered the main entrance of the school the day of the shooting about five minutes before he shot Willey in the head with his father's gun. The same bullet traveled into the leg of Desmond Barnes, who had sought shelter in a classroom. Rollins then turned a corner and passed several classrooms before the confrontation with the school resource officer, which occurred about three minutes after shooting Willey, the sheriff's office said. Rollins and Gaskill fired their weapons about 30 seconds later."